I am part Swedish and for my entire life I have been wearing clogs and loving tomte. 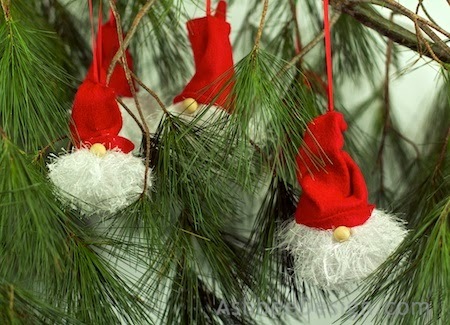 I have posted about the little Swedish elves before and you can read about their history here. 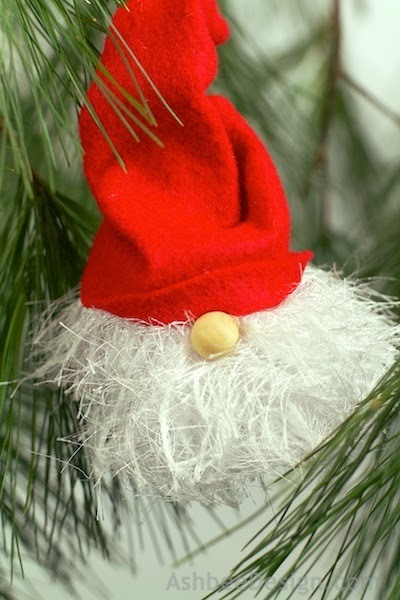 In nutshell they are temperamental house helpers that, in modern times have become associated with Christmas due to their red hats and beards. I have a collection of them and they appear in the nooks and crannies around our home for the holidays. I have been wanting to create my own and this year I decided my annual hand-made Christmas ornament would be a tomten. They come in all shapes and sizes with wonderful personalities but my favorites are the ones that are buried in their beards and hats, so that is the type I crafted. 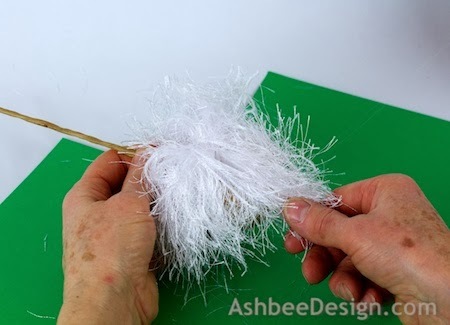 Here are the steps for making this quick, fluffy tomten tree ornament. 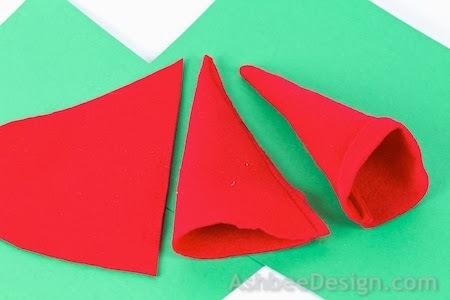 Drill and bit - about 7/64"
Cut pie shaped pieces of red felt. 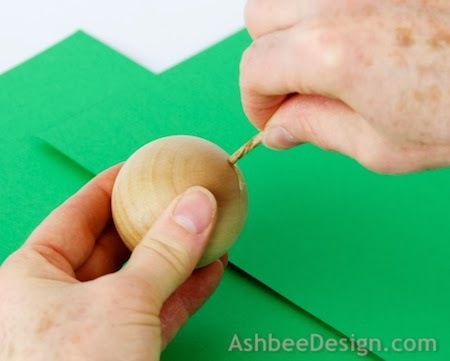 For a 2" wooden ball it should be 7" long on each of the sides and about 6.5" along the diameter. 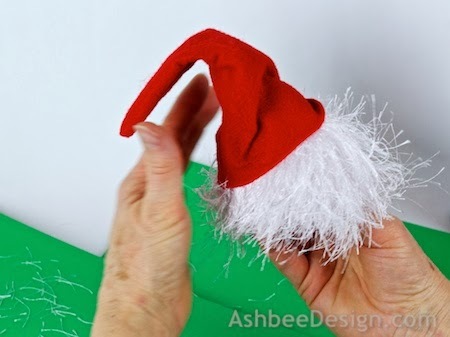 Stitch up the 7" side seam to make the hat. Sew close to the edge. 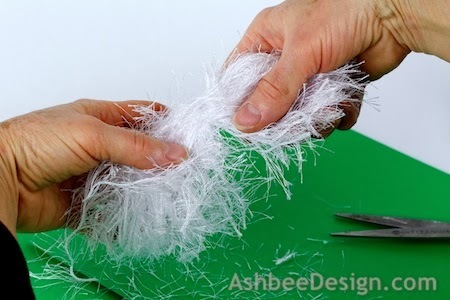 If you don't have a sewing machine you can experiment with felt glue. 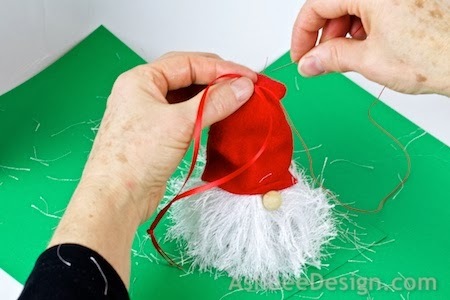 Turn the hat right-side out and fold up the front rim about 1/4". Use hot glue to glue up the front rim. 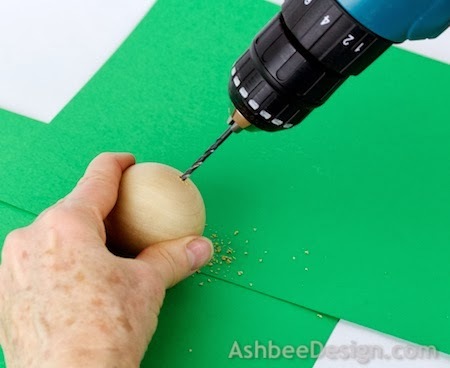 Using a small drill bit ( I used 7/64) drill a hole into the wooden ball at and angle. You might need a different size depending on the size of your stem wire. 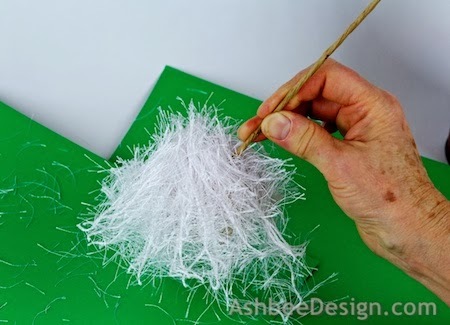 Cut a length of stem wire about 7" long and glue into the hole. I used 5 minute epoxy. Fold the cardboard in half so it is double thickness and about 3" x 6". 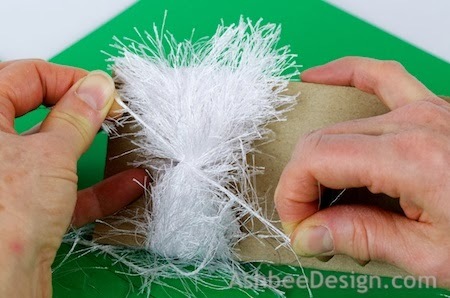 Wrap the fuzzy yarn around the cardboard form 70 times. This amount might have to vary depending on the thickness of the yarn you use. My was thin. Take an additional piece of the yarn and tie all of the loops together tightly. 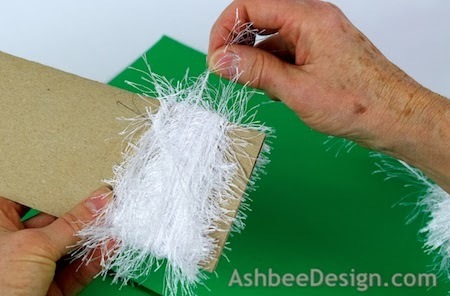 Slide the yarn bunch off the cardboard. 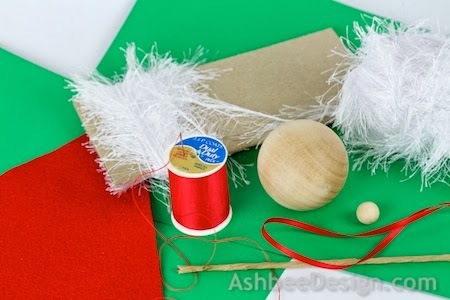 Use sharp scissors and cut through the bottom loop of the yarn bunch so it opens up with the knotted string in the center. 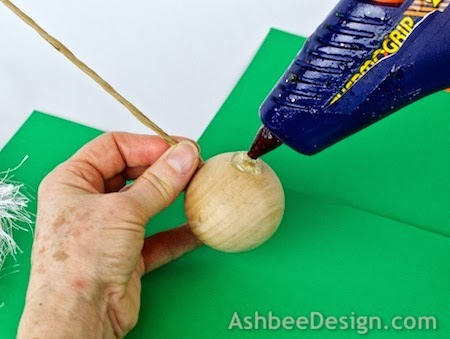 Place a blob of hot glue onto the wooden ball about 3/4" in front of the wire stem. 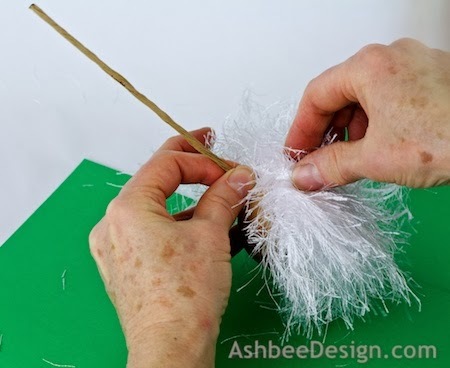 Place the knotted center of the yarn bunch on top of that glue blob and press in place. This knotted spot should be at approximately the top of the head. It will be covered by the front of the hat which will go over the wire stem. Spread the hair out to either side and put a glue line from side to side about where his smile would be. 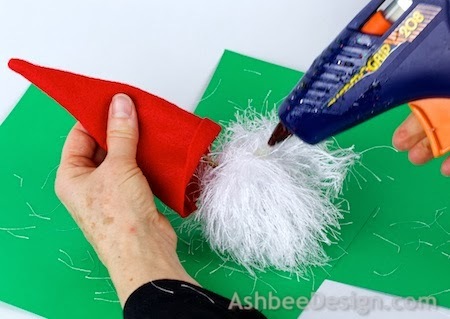 Pull sections of hair around to the front and attach to this glue line. You want the entire front to be well covered in fuzzy yarn. You don't have to be very fussy but you do need good coverage. Add glue if needed. Repeat the same thing on the back side about 1/2" below the wire stem. You may need to apply a little on each side as well. 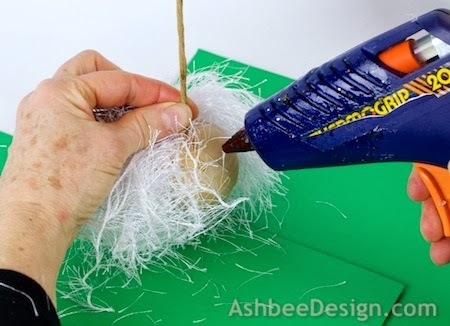 Study the ball and look for areas not covered and use glue to attach some yarn there. The ball will look really wild at this point. 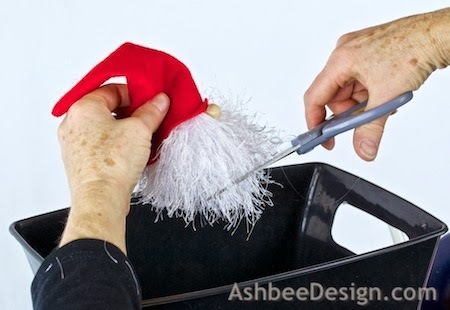 Slide the hat over the stem wire with the seam on the back-side. Cut the wire if it is too long. 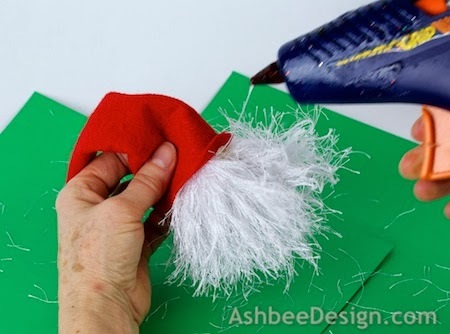 Place a dot of hot glue on the top of the head and glue the front brim of the hat there. 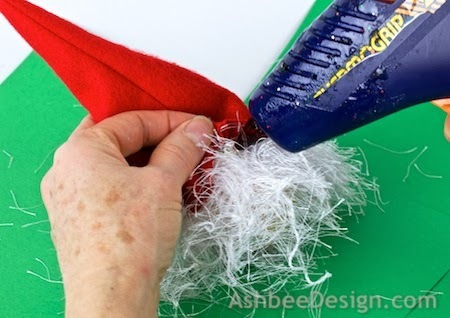 Add another dot of glue beneath the back rim and glue the hat there. You can add dots to each side as well. Bend the wire inside the hat to give the tomten a unique character. 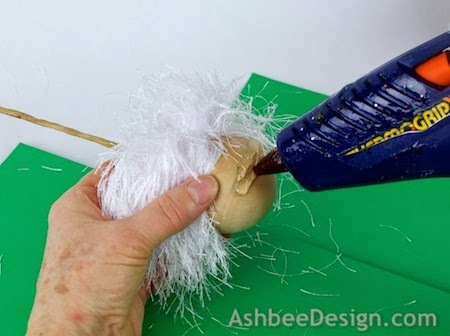 Attach the 1/2" wooden bead as a nose. Now, working over a wastebasket and using sharp scissors, start trimming your tomten's beard and hair. This starts to tame the wild appearance. I was aiming for a well rounded bottom edge. I also found it helped to shorten hairs round the nose. 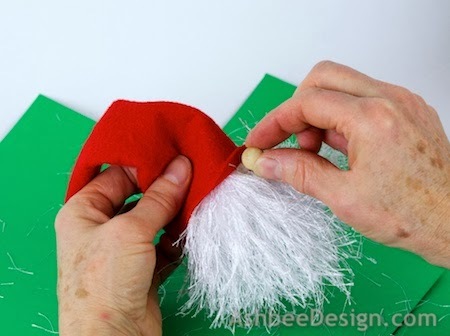 Make a loop of 1/8" red satin ribbon and stitch it by hand to an appropriate spot on the hat. These are just the cutest and thanks for sharing the 'how to'. I have a couple in my collection thanks to my pen pal from Finland…I think they are adorable. I have about 25 now and give them every year to my daughters. I hide them around the house for the grandkids to find. I love these! Thanks for an easy way to make them. Happy to make you laugh. Makes my day! These are wonderful!!! one question were did you get the wooden balls? I got them at Woodcrafts Suppy but now they have them at Amazon. Just search on wooden balls! buenas noches desde montevideo uruguay sur america , muchas gracias por el tomten ,maravilla , hace mucho que lo busco gracias!!! I bought one that looked like this at Pet Smart, but with a blue velveteen hat instead of red! It had crinkly plastic in the hat and catnip in the stuffed head!